Indonesia is home to six out of seven of the world’s turtle species. At one of the few locations on Nusa Penida where turtles still forage and nest, Venner af den nationale Parks Foundation (FNPF) has established agreement with a local village to extend their community-based protection to the sea turtles on their beach. FNPF is an Indonesian conservation nonprofit organization working to protect wildlife and its habitat, på samme tid som støtte lokalsamfund. If you would like to help FNPF and the village protect their environment and preserve this endangered species then here’s your chance. 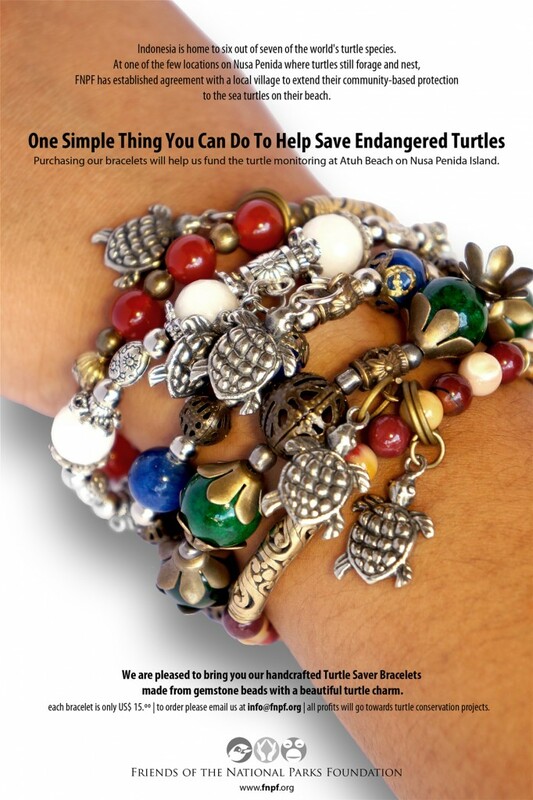 We are proud to bring you our hand crafted Turtle Saver Bracelets to help you show support for the cause close to your heart. We are pleased to bring you our handcrafted Turtle Saver Bracelet, made from gemstone beads with a beautiful turtle charm. It makes a perfect souvenir or gift and all profits from the sale will go towards turtle conservation projects. Each bracelet is only US$15.00 [ to order please email us at info@fnpf.org ] or drop in to FNPF’s headquarters on Jalan Bisma no. 3 Ubud. We’ll be happy to share all we’re doing for wildlife, levesteder og mennesker. A big thank you from the turtles and us for your support! *Note : The gemstones are vary (Mookite, Carnelian, Blue Jade, Green Jade, Black Onyx, White Onyx, Pink Pearl Shell, Pink Onyx, Jadeite, and Agate).